Ogma's Tale of the Trees? ... and how would time in the woods be healing? I've been in a very active debate in a group where one of my pet passion subjects came up, which is the way people are often incredibly heavily focused on the crucifixion story at Easter and then skim over and even brush aside the Resurrection, which I find is one of the most beautiful stories told. Its not a story only told with Jesus as the main character but has been told through time with many characters in different settings and circumstances. Even told in Return of The Jedi, the third of the first Star Wars set, and certainly through mummers tales. As you may know I present the Ogma tale as 20 scenes, one for each of the original ogham symbols, split into 4 octaves, each with 5 sounds to symbols, forming a pentatonic scale in each octave. Those four octaves form a cycle, stitched together with the inner regenerating rebirth nature of the Yew, the last symbol. The cycle of four quarters being like the cycle of the seasons of a year and the four quadrants of an astrology chart. The 4 seasons of the year are split, today, into 12 months, a solar division. I find it interesting the Jesus choose to have 12 disciples. The group debate, I mentioned above, kept coming back to the blood, gore and torture imagery now portrayed as the crucifixion. No matter what I was posting it seemed everyone was proving my point that people are fixed to the crucifixion imagery and pass by the Resurrection, or may not even get there. I will leave that road alone for now, but what I was presenting was how stories change over time often to suit what seems to be popular with the people and to promote a specific agenda. Maybe the agenda thing is what I am honed into with this bit of writing too. I am fascinated by the transition of tradition at what I call Lasir's Well outside of Keadue. Lasir, the ancient goddes or teacher of vision who helped people to see clearer, calm the mind and see vision through inspiration, third eye stuff. The later Celtic Christian St. Lasiar, a variation of St. Lucie and Lucy, also revered for helping people see clearer, but this time with their physical eyes, even to the point of curing the blind. In the past I have seen several spectacles left at her well. "My belief is that the crucifixion of Christ is a symbolism of the completion and creation of a cycle, a 4 cilles life cycle of journey through being the born individual to learning to relate, uniting with those connected to (12 disciples 12 signs) and then divine service. Like the Lasir story, I wonder if a cross pollination has happened with the crucifixion story. 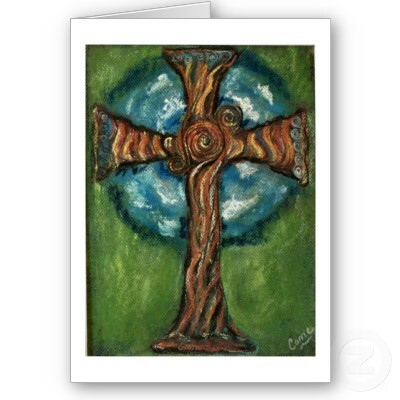 Has a story of the cycle of life been re-translated as a physical hanging on the cross. If we consider the additional stories, floated around, of Christ travelling in Celtic lands in Indo Asia, during his lost years, the story of the cycle of life would be a firm belief carried by him. What if the story of applying christ to a cross as a form of punishment and torture was a later created story created to instill fear in people, the fear of sin and how the priest can cure it. This maybe why people focus more on the crucifixion more than resurrection, an attempt to face fear but at the same time discovering a relationship to it and even security by it ... and the resurrection is cast aside. Easier to cry in a beer and even smash the glass in our hand than cast it aside, let it go and drink a healthy water and smile." ... that's just some of my blether there. I believe a lot of illness is generated by our belief and focus on crucifixion and applying that torture version of the story image in out lives. The images of hopelessness and guilt of what we did not do, what we think we harmed, concerns of our past carried in the present, our baggage. Add to that the images of what may happen in the future as an animation projection of our own "crucifixion" images of the past. What we cast aside is our present, always, always our moments of Resurrection. In the woods, I hope our bardic moments are times of personal Resurrection. A time when concerns and anxiety or not allowed to enter. Only the present matters for awhile. A time that gives sanctuary to be able to listen, be inspired, and then share. An organic cycle of having a voice and using it along with listening. Of course, this clashes and competes, voices like tuning a radio in between two channels sometimes, and sometime "dead air", but these moments do not harm us, worry us or concern us there. I believe this is a process of healing. We have the 4 octaves of healing in our Bards In The Woods gatherings. First, the individuals turning up after all those challenges of shall I, or will I not bother, is it worth it, and so forth, and then turning up. You soon become aware of how the physical movements in the woodlands gets muscles and body systems moving, air churning around our bodies, blood moving about, bones lubricating, all that good stuff. being in the air and senses provoked by the nature around us. ... without condemnation, suppression, discouragement, guilt. And then the divinity of completing our "crucifixion"